Summer keeps deserting us here in NZ. Apparently El Nino is here to stay and she is wet, very wet. That relentless rain that you know is settling in for the day, simply a continuous downpour pitter pattering for hours at a time. So we are missing out on our usual long hot sunny days, BBQs, G&Ts on the deck or an early afternoon Pimms, picnics on the beach, sand between your toes, sunburn...all the pieces of a kiwi summer. Much as I would rather have blue skies and sunshine, grey and overcast or wet and wild do lend themselves to reading (The Lucky Peach, lots of food blogs, Anthony Bourdain's The Nasty Bits, about to start Keith Richard's Autobiography), Boardwalk Empire marathons, multiple trips to the movies (The Iron Lady; Meryl is amazing, The Whistleblower; heart wrenching but brilliant, The First Grader; wonderful but take the Kleenex along, The Debt; classic old school spy thriller) and of course baking and cooking. Maybe a chore for some but for me a perfect afternoon. So one afternoon saw bread baked, some Seedy Oat Bread and my new favourite Braided Garlic and Herb Bread from here. Then it was on to cake, as afternoons also lend themselves to cups of tea and it being the holidays it is only appropriate that tea comes with cake. The basic base for this cake comes from Donna Hay and true to form it couldn't be easier as it is a one bowl wonder. 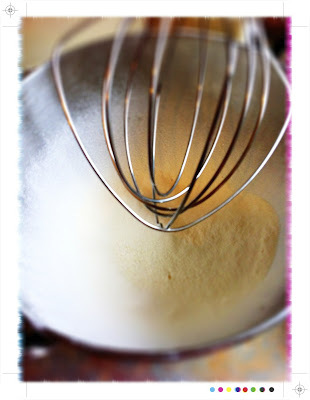 Place the flour, sugar, butter, vanilla, eggs, milk and lemon zest in the bowl of a mixer and beat until just combined as you don't want to over mix it. Spoon the mixture in to a 22cm (9 inch) cake tin greased and lined with baking paper. 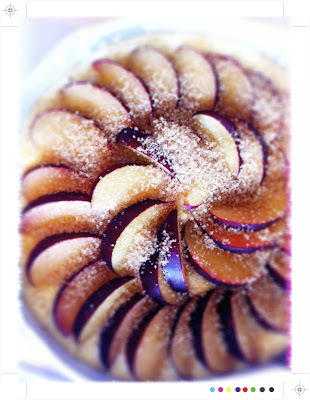 Top with the slices of plum and sprinkle over the demerara sugar. 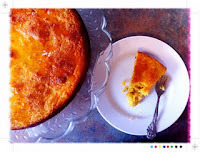 Pop in the oven and bake for 45 minutes or until the cake is cooked through. Test with a skewer and when the cake is cooked a skewer will come out clean. 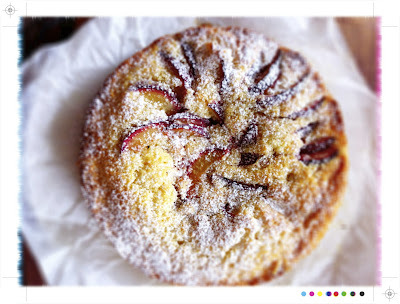 Allow the cake to cool, slice and eat along side a cuppa. The cake looks so pretty with its plum topping! Damn weather is infuriating - summer, where are you? Sounds like you are making the most regardless. This sounds so easy to make - now I just need the courage to venture out in the driving wind and rain to shop......! Apparently next week is looking pretty amazing - right when I head back to work. Gargh! Why did summer have to pan out this way?! But on a brighter note, this cake looks delicious, summery, and classic. Delicious, Mairi! 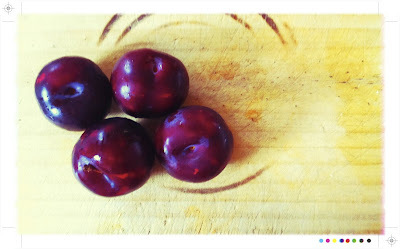 Was about to make a plum shortcake as I have a bucketful of plums and loads more on the tree but this looks way easier so I am off to try! So true about the weather and all the indoor activities - chill out either way! 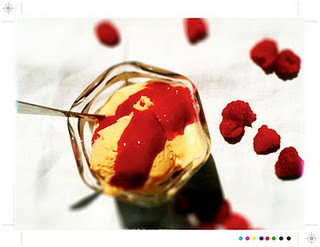 First, this looks amazingly yum. Second, thanks for your side dish ideas over the holidays - it turned out that we had to do appetizers instead so I didn't get to use them! But I will do them this winter for sure... Third, I just read The Nasty Bits too, and aside from all the culinary/French terms that I was clueless on, I loved it. He's so entertaining! Anyway, happy new year!! Right, I've made it now and eaten it (a slice, not all of it!) and it is delicious - the best plum cake I've tried so far - and super easy. Thanks for sharing! That looks fabulous. 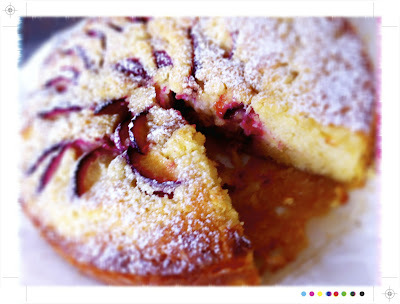 I hear a rumour that my blog is coming out of retirement this weekend and cakes are the order of business. That's where the rain is! On the other hand, it's unusually dry here, Mairi. Our winter is usually wet, and we are experiencing spring-like weather. I do love spring, but California needs water...Please send us some rain =). Thank you. Your cake looks perfect, and I bet it's as delicious as it looks! 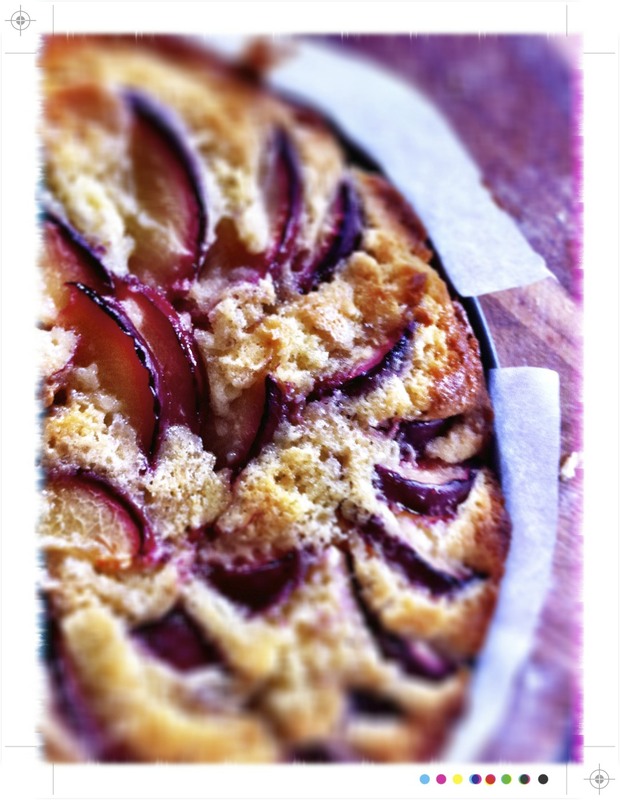 Yum looks AMAZING, I made a plum and coconut cake using plums from next doors tree. I just wish I ate it in the afternoon sun instead of a wet and windy one! Brunch soon with the girls??? Back form the beautiful island of Waiheke....so thank you for all your kind comments! Happy cake baking! Looks delicious, perfect for this wild "summer" weather. Hope you had plenty of proper summer on Waiheke! Thanks Mika, it was wonderful and sunny on Waiheke...heaven!